“It’s worth fighting for. . . . This is about our economy, it’s about jobs, it’s also about our traditions and our values,” Senator John Kerry said, at an event earlier this month launching a cranberry caucus. 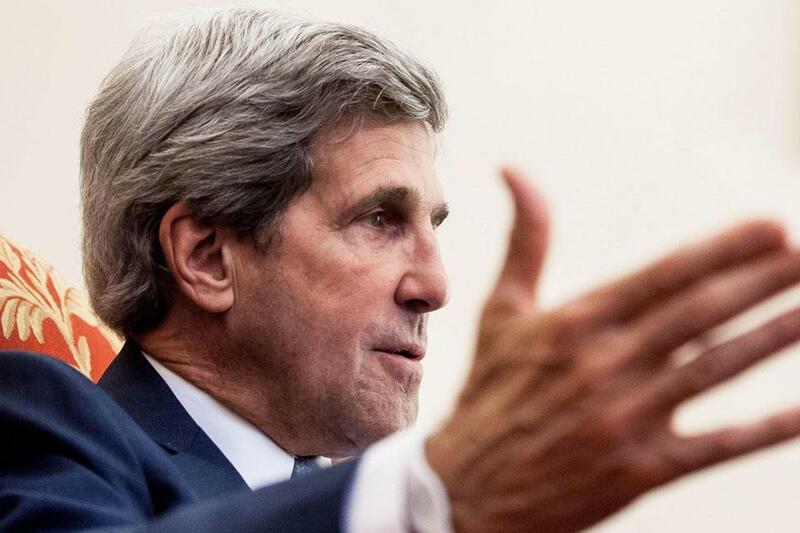 WASHINGTON — Senator John F. Kerry, chairman of the Foreign Relations Committee, is accustomed to tackling big issues, like war and the balance of world power. But recently he has been extolling the health virtues of the diminutive cranberry, particularly for urinary health. Senator Scott Brown has also taken up the cranberry cause, holding up photos of himself deep in the bogs of Massachusetts, sharing proudly that he sprinkles the dried fruit on his morning cereal. It’s more than just bipartisan berry boosterism. Cranberry industry officials are leveraging high-profile support to help keep cranberry juice cocktails off the list of sugary drinks that could soon be banned from schools as part of a campaign to reduce childhood obesity. Kerry, Brown, and other cranberry boosters say the antiobesity campaign, while laudable overall, aims to unfairly vilify the state’s top agricultural crop. To help the industry spread its gospel, executives enlisted Kerry, Brown, and Bay State Representative William Keating, who represents the 10th Congressional District, to headline a 17-member congressional cranberry caucus, whose members will serve as ambassadors for the cranberry. The issue arises because the extreme tartness of cranberries requires a large amount of sugar to make the juice drinks marketable. 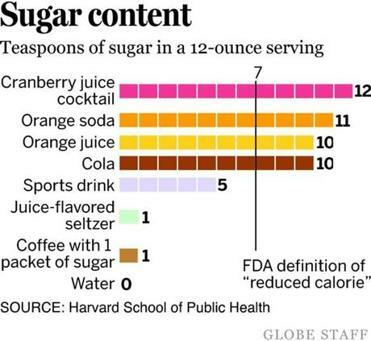 Dieticians at the School for Public Health at Harvard University say it takes 12 teaspoons for a 12-ounce bottle. That is two more teaspoons than what is in a can of regular Coke. Some other juices require no extra sugar. The biggest threat to the fruit comes from the Department of Agriculture, industry spokesmen say. Regulators there are drafting nationwide standards that could ban sugary soft drinks, including cranberry juice cocktails, from vending machines and a la carte menus in the nation’s schools. According to data compiled by the Centers for Disease Control, nearly two-thirds of the country’s schools — and nearly half of all schools in Massachusetts — allow sugary drinks to be sold. The figures on childhood obesity are stark. The government estimates that about a third of all American children are overweight, a dramatic rise from just 7 percent in 1980. The proliferation of drinks packed with sugar, including juice cocktails, is a leading cause for the rise in rates, health advocates say. While cranberry juice is hardly a staple at school campuses, industry officials worry that the snub at schools could affect purchasing decisions at home. They do not think the industry can win this particular fight, but they hope to influence the debate so that by the time the USDA takes on the more substantial task of updating its overall nutritional standards — once known as the food pyramid — the little berry will be vindicated. Their line of defense goes like this: The cranberry has unique health benefits. The industry, which funds at least $150,000 a year in nutritional studies, says it provides high doses of Vitamin C, antioxidants, and naturally forming compounds that some studies suggest could help the body fight everything from urinary tract infections to plaque, even cancer. Plus, the health advocates say, many of the fruit’s therapeutic properties have yet to be scientifically proven. The potential ban of cranberry juice drinks in the schools is just the latest challenge for the industry. Some in Congress have been pushing for a national tax on sugar-sweetened drinks, as well as prohibiting schools from serving drinks that are not labeled as 100 percent juice. Also, water quality rules could restrict the industry’s use of pesticides around bogs. And in California, a proposed labeling law for genetically modified foods could pose problems for cranberry drink producers who use processed sweeteners. Growers and processors of the cranberry have felt besieged. “Enough was enough,” Papadellis said. Since 1998, Ocean Spray has spent more than $5 million on lobbying expenses, according to the website OpenSecrets.org. During the same time period, an Ocean Spray PAC contributed more than $430,000 to candidates from both parties, most from cranberry-growing states or members of powerful agriculture-related committees. The cranberry caucus on Capitol Hill also includes Representative Jim McGovern of Worcester. Its members hail from the country’s largest cranberry-growing states, such as New Jersey, Washington, Oregon, and Wisconsin, which has eclipsed Massachusetts as the biggest producer of the crop. Still, the cranberry is a significant economic engine in the Bay State’s agricultural sector. The 325-member Cape Cod Cranberry Growers’ Association brings in about $88 million annually from crops grown in more than 14,000 acres of bogs in Southeastern Massachusetts. Ocean Spray has sales of $2.2 billion worldwide. Massachusetts remains the “spiritual center” of the cranberry industry, where Native Americans introduced the fruit to the Pilgrims. To honor the fruit, the state in 1970 decreed cranberry juice as the official beverage of the Commonwealth. Lawmakers say there is much work to be done to restore its reputation. Bobby Caina Calvan can be reached at bobby.calvan@globe.com. Follow him on twitter @GlobeCalvan.